In our previous homes, we have had a cloakroom as long as we can remember. So, when my hubby and I (plus our beautiful cat Mushka) moved into our one-bathroom Suffolk ‘project’ last year, we knew an additional loo would be a priority. However, that’s easier said than done when you’re undergoing a major renovation project. We’d got the builders, Chapel Properties, and architects, MaxDesign, in place. So we tasked the latter with the job of redesigning our ground floor space to accommodate a cloakroom. This included creating specific areas for a utility room and kitchen diner. But that’s a story for another blog post. We wanted to design a cloakroom, which would be situated between our lounge and soon-to-be utility room. So, once we were given the room dimensions, we could get stuck in. We absolutely love the design process! Maybe it’s because I’ve been a journalist for more than 25 years and interiors has always been such a big part of that. In addition, this was our chance, as a couple, to put our personal stamp on a room. We knew this room would give us a great chance to be creative. After all, the cloakroom should be the easiest space to update, due to its size. This is where you can also get away with a more adventurous design, especially if you don’t feel confident enough to experiment in this way in a larger room. In addition, we have found social media channels, such as Instagram and Pinterest so useful for inspiration. We have also visited various ‘homes shows’ for more ideas, from Grand Designs to House & Garden. So, without further ado, we started thinking about which look we wanted achieve in this room. The first thoughts, which came to mind, were to have a fun space! After all, friends and family would need to use this space so why not make it feel cosy, bright and inviting? The fact this room doesn’t have any windows was also a key consideration. Therefore, we decided colour would be important. It’s also rather compact, so we took size into consideration. This way, we could potentially lift what is essentially the smallest room in the house. Also, we knew guests would be more likely to see the cloakroom, when compared to our main bathroom. 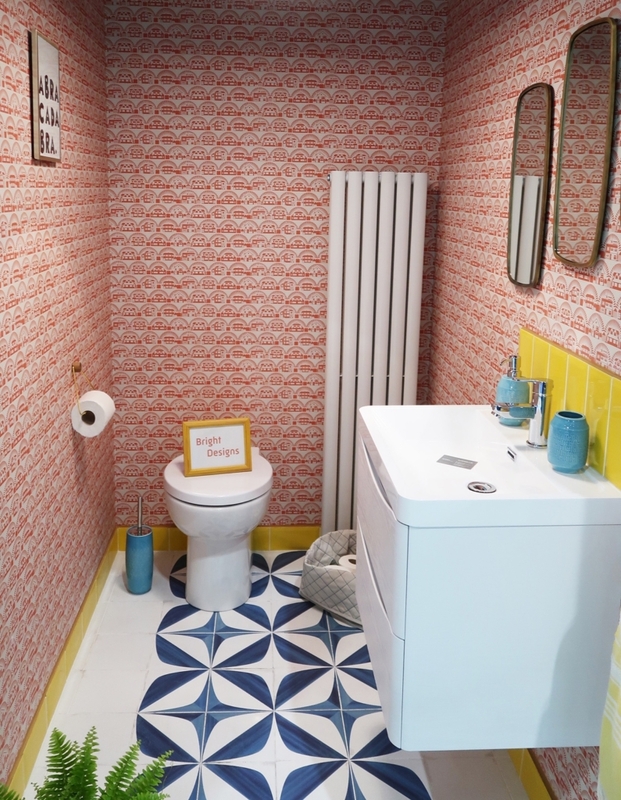 Then, as luck would have it, the Grand Designs show showcased a Lavatory Project earlier this year! So, as soon as we saw this display by interior designer Maria Gratsova of Bright Designs, we felt it captured what we were hoping to achieve. We looked at the flooring first and soon realised functionality and style would be major factors. We particularly liked the idea of some sort of pattern on the floor of this cloakroom for a more interesting finish. Reclaimed tiles initially caught out eye then we settled on Arthouse Leaf tiles from Porcelain Superstore. Bright Designs showcased these tiles at the show so it made sense to choose them as we could see that they worked so well. These tiles are gorgeous and we found the whole online shopping process straightforward. Just look at the pattern! They are versatile as you can pick different formats to suit you. We just love the crackle effect too, as this creates a striking vintage finish. We toyed between paint and wallpaper for quite some time. Now, we’ve moved into a property with wallpaper, which has seen better days. But we couldn’t let this put us off! In fact, we eventually decided on a mid-Century style wallpaper, Metroland in Harvest Orange, from Mini Moderns. You can see just how gorgeous it looks in the Bright Designs cloakroom. We then met the Mini Moderns owners, Keith Stephenson and Mark Hampshire, at the House & Garden Fair in the summer, where they had just launched another new collection. So, it seems they really do have something for everyone! We wanted something clean and simple but functional, too. So we chose a WC with a soft-close seat and a vanity unit. 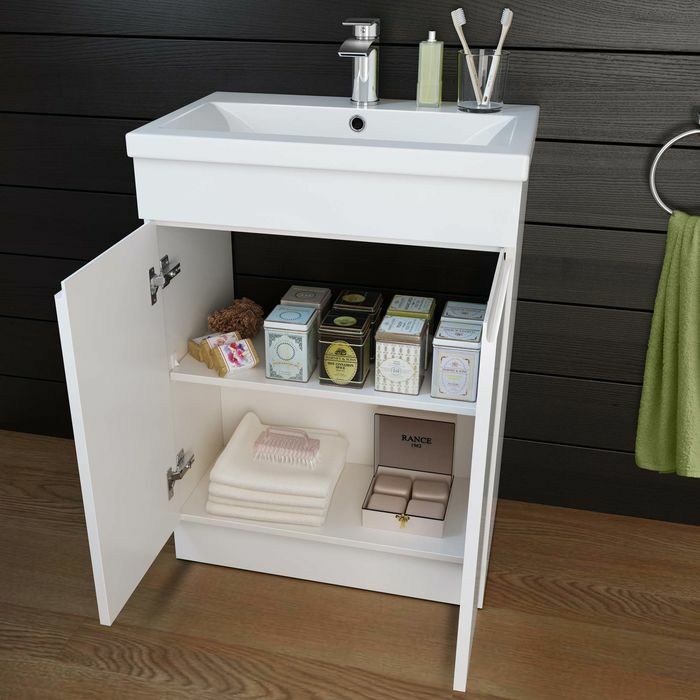 The vanity provides the perfect place for loo rolls and cleaning products, and looks good too! It’s also fairly narrow which creates more space in front of this furniture. The pop-up waste is easy to use in this cloakroom with an attractive tap for a designer finish. We picked soak.com and found delivery easy. The aim here was to choose sanitaryware, which would be in proportion with the space. So, the vanity unit is the perfect size as it has been designed to be compact but the basin still provides plenty of room for washing hands. At one stage we thought about spotlights but felt it would make the cloakroom look too clinical. So we opted for a ceiling rose instead and simply picked a neutral lampshade from John Lewis. We haven’t chosen all our accessories yet. However, we have bought an Oxo loo brush. It may seem strange to get excited about this accessory… But these are such good quality and in a clean, white finish, this won’t detract from the cloakroom design. We decided to recycle an existing towel rail radiator, which was in our original kitchen. We’ve also bought a beautiful vintage-style mirror and some Scion towels in mustard from John Lewis.We plan to start looking at loo roll and towel holders, once the the tiles and wallpaper are in place. So, we’d love to hear your ideas on our social media channels. At the moment, our cloakroom consists of four bare walls with a working WC and vanity unit in place. So it’s looking bland but we’re glad the bare bones are there! This room is due to be completed once building work on our kitchen diner has all but finished. We are currently at the stage where steel joists are being put in place in that area which, you can imagine, is painstaking, but exciting. Then we hope our cloakroom will be furnished by spring next year. So we look forward to sharing all the pictures from this project as soon as everything is in place. If you want to know how to start planning a kitchen from scratch, read our blog post on choosing a kitchen design.